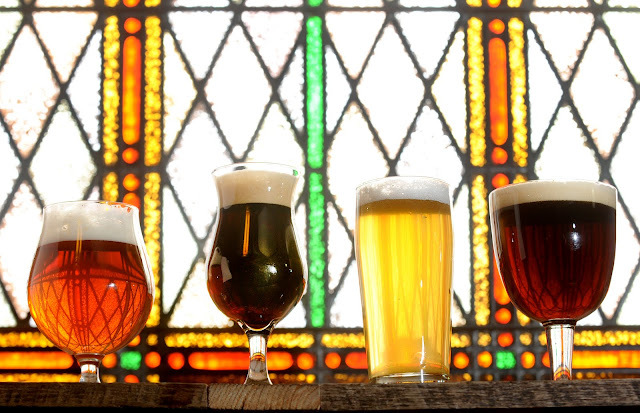 This entry is cross-posted from the Brewery Vivant blog. 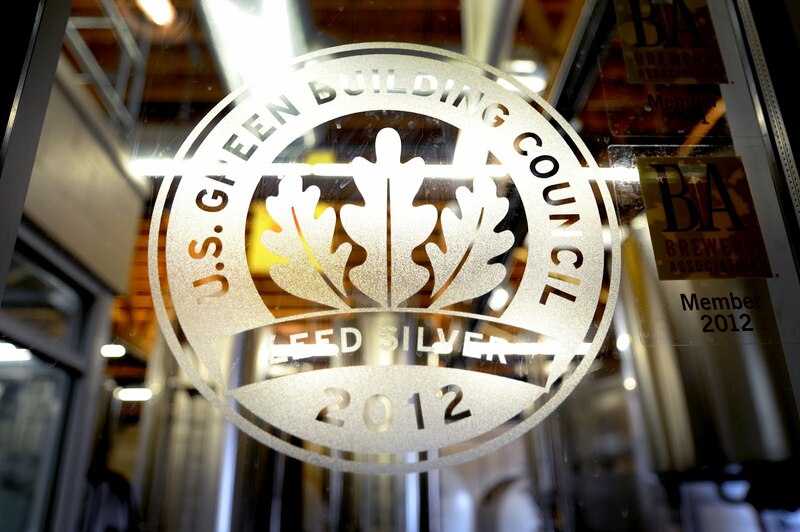 We recently received our LEED Silver (Leadership in Energy and Environmental Design) certification at Brewery Vivant and found out at the end of the process that we are the first commercial microbrewery in the United States to do so (or as Mayor Heartwell put it, the first in the galaxy). That is pretty cool. However, we did not go through this process just to have a marketing tool to talk about. We see this plaque that hangs on our wall as a symbol of the way we want to run our business. LEED design takes more into account than just using high efficiency appliances. It looks at the project as a whole including diverting demolition waste, using earth friendly materials, proximity to public transportation, and creating enjoyable work environments for employees. We see it as a holistic approach to business that weighs how businesses fit into a community. Our intent from the beginning was to build a neighborhood brewery and it all started with the site selection. It would have been much cheaper and easier to build a pub from the ground up on a new site outside the city limits. But what fun would that be? The atmosphere we have created by utilizing the existing historic architecture is priceless. As far as our brewing facility, it would have been far cheaper to rent some warehouse space for $2 a sq ft in some industrial park. But then we would not be able to give the personal tours of our process to the people that visit our pub. The way we did things creates a whole and unique experience. This article is cross-posted from GulfLife.com. U.S. Sen. Roger Wicker will tour the Cottages at Oak Park in downtown Ocean Springs at 2 p.m. today and presented the development team with the U.S. Green Building Council's LEED Platinum award. It's the organization's highest level certification of energy efficiency and environmentally responsible construction. ceremony on Thursday, August 11, 2011. 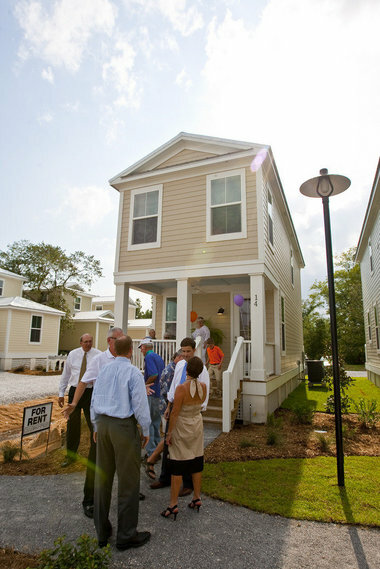 "The Cottages at Oak Park is a great example of how to rebuild after a terrible disaster like Hurricane Katrina," Wicker said. "These cottages are built structurally superior to a typical home, providing a safe place for residents to live and qualifying for lower insurance rates. Affordability is also enhanced by building at the cottage scale in close-in locations and with energy-efficient techniques and materials. 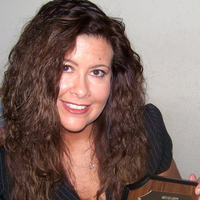 It's a winning combination that reduces residents' monthly power bills and transportation costs." Wicker will be joined by representatives from Gov. Phil Bryant's office, the Mississippi Emergency Management Agency and the city of Ocean Springs. Bryant said, "The need for quality, affordable housing on the Gulf Coast grew after Hurricane Katrina, and I am pleased to know that this development will not only help satisfy that need but has achieved LEED Platinum certification." Last week marked the kick-off of the BlueGreen Alliance’s annual Good Jobs, Green Jobs (GJGJ) Conference. The founding premise of the BlueGreen Alliance was to marry the aims of organized labor and environmentalists in common support of good, green jobs. This eclectic, yet compatible, mix of attendees makes GJGJ different from your typical green jobs affair. For the conference’s fifth anniversary, GJGJ left Washington, DC and hit the road with a series of four regional conferences. 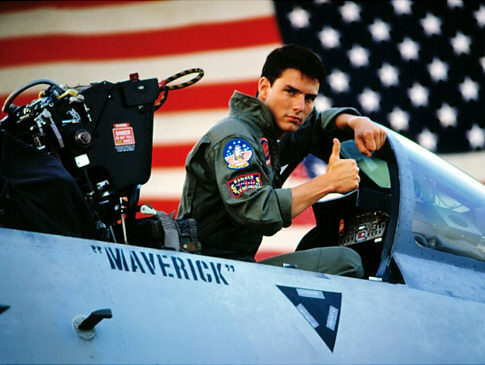 While the green building movement continues to move forward at an incredibly rapid pace, that’s not why I bring up this seemingly non-sequitur reference to Top Gun. The quote, oddly, reminds me of something deep and soulful to the green building movement – the need to lead. Just think about our movement’s standard bearers – Rick Fedrizzi, David Gottfried, Gail Vittori, Rob Watson, Bill Browning, the late (and very missed) Ray Anderson, and the list goes on. This mantra – the need to lead – is clearly a core and universal driver that excites us, impels us, influences us, sustains us and inspires us. I think of the $1.4 trillion net opportunity of green building, an economic driver that would drive enormous energy savings and job creation (See Mathias Bell’s recent blog). I think of Project Haiti, bringing green building to those who need it most (See Marisa Long’s recent blog on the inspirational project). I think of a university set to build 5 LEED Platinum buildings. I think of McGraw Hill’s forecast that green homes will increase five-fold from $17 billion in 2011 to between $87 and $114 billion by 2016. I think of the 1.5 million square feet of real estate that is certified to LEED each day, the equivalent of three Empire State Buildings a week. I think of the revival of the innovative financing vehicle of Property Assessed Clean Energy (PACE) Bonds, which could provide “unlimited funds for energy efficiency.” (See Green Technology’s interview with the head of Ygrene Energy Fund, which is advancing a $100 million investment in building retrofits). I think of the new Green Ribbon Schools Program, a program advanced by Secretary Arne Duncan and the U.S. Department of Education that will recognize schools that save energy, reduce costs, feature environmentally sustainable learning spaces, protect health, foster wellness, and offer environmental education. I think of all the opportunities the Obama Administration can take right now to advance Better Buildings through Executive Action. Well by now, like Goose, you know the rest of the bit. You live it. And you do it everyday. Postscript: Yes, this entire blog also serves as a monitory note on the dangers of watching the Sunday Matinee with green building on the mind. In recent years, there has been a boom in the construction industry and demand for green homes even while the real estate market continues to struggle. This is a clear sign that prospective buyers find value in green homes. Studies show that green home construction is growing, and more and more home buyers are listing green attributes like energy efficiency as a top priority when looking to buy a home. And when homes do sell, green homes sell for more. But while this trend is very positive, the reality is that most buyers have trouble finding certified efficient, green homes in their area because the real estate infrastructure used by the industry doesn’t allow this information to be shared. The Multiple Listing Service (MLS), the primary platform for listing and selling a home through a realtor, lags far behind the market in most regions in reflecting the energy efficiency and green building information those prospective buyers want to see. Of the 860 MLSs nationwide, less than 100 include searchable green data fields. Such fields include information on things like third party certification standards like LEED for Homes certifications or HERS Index scores. Are you an architect? A facilities manager? A building owner? How about a professional working in a big city high-rise? A father with kids in elementary school? An unabashed shopaholic? 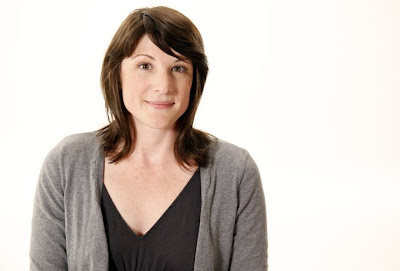 Great, let’s talk LEED 2012. The third public comment period for LEED 2012, the newest update to the LEED green building program, opens in just five business days on Mar. 1, giving anyone with a stake in our built environment (in other words, everyone) the opportunity to influence the direction LEED takes: seasoned green building pros to college students just beginning their sustainability journey. Building owners to occupants of any kind. LEED engages and impacts millions (billions?) of people around the world. Its success is in part due to the fact that it is developed by the people who use it. LEED is an ongoing, global project that anyone can join. There’s no other rating system out there that engages the public quite the way LEED does, and we hope you’ll consider voicing your opinion about LEED in the approaching public comment period. Imagine a world where potential is not governed by what we're told to be, the only fear is not giving enough, and business-as-usual, is a little more...unreasonable. As a USGBC Emerging Professional, Colorado Chapter member, and young social entrepreneur, this is the world I’m working to create. After a year serving Flatirons Habitat for Humanity (Boulder, Colorado) as an AmeriCorps VISTA, I approached a fork in the road. Do I confirm my acceptance to graduate school and pursue my Masters of Architecture? Or, do I pursue a slightly less conventional path: one filled with incredible potential, but also substantial uncertainty? Two years later, after the completion of 17 LEED-registered affordable homes, the training of 115 now-qualified LEED Professional exam candidates, and fundraising of $20,000 for affordable housing builders, you will see that I chose the latter. In 2010, at age 23, I co-founded a social enterprise, called BOULD, with the ambitious mission to eliminate substandard housing through green building education. Here’s how it works. First, we train local affordable housing builders (AHBs), like Habitat for Humanity, to transform housing projects into structured, green building classrooms for career developing professionals and students. Our program, EverbuildPRO, provides leadership opportunities at all phases of a project: from design development to LEED documentation to on-site construction. Upon program completion, participants have the project experience they need to qualify for LEED accreditation, the world’s preeminent green building credential. Then, in return for the opportunity, professionals pay a tuition fee that is shared between BOULD and the AHB, making “green” affordable and accessible for all. 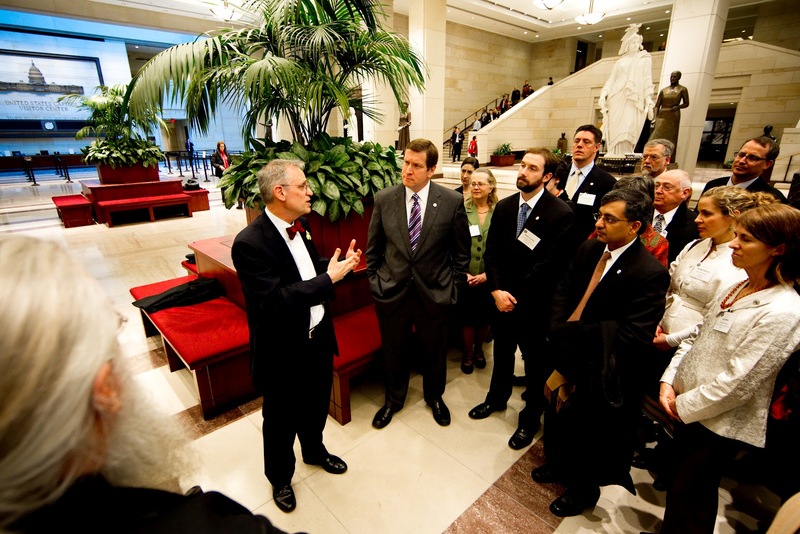 Yesterday, Representative Charles Bass (NH) and Representative Jim Matheson (UT) introduced bipartisan legislation that deploy energy efficiency programs across many sectors of the built environment. H.R. 4017, “The Smart Energy Act,” picks up on the bipartisan work of Senators Jeanne Shaheen (NH) and Rob Portman (OH), by enhancing financing options for building efficiency at the Department of Energy (DOE), as well as boosting energy conservation within the federal government by expanding the use of private financing tools to pay for energy-efficient building upgrades and consolidating federal energy data centers. "The federal government spends $7 billion annually to heat, cool, and operate its 445,000 buildings. Given our nation's fiscal constraints, a common-sense place to save taxpayer dollars is by improving the energy efficiency of the hundreds of thousands of federal buildings across the country." While this bill is far from being sent to the President for his signature, the introduction of this bipartisan legislation is an important first step in the process of increasing our nation's energy efficiency. As members of the House and Senate tax writing committees continue to negotiate over the extension payroll tax cut and other tax incentives, six senators of the Senate Finance Committee, spearheaded by Olympia Snowe (ME) and Jeff Bingaman (NM) sent a letter to Treasury Secretary Tim Geithner and Acting Director Department of Office of Management and Budget (OMB) Jeffrey Zients urging them to advance policies to improve energy efficiency and continue to support clean energy incentives. Specifically, the letter calls on Treasury and OMB to improve the guidance on the 179D Energy Efficient Commercial Building Tax Deduction. “…as authors of the Energy Efficient Commercial Building Deduction (U.S.C 179D) we support the Administration’s Better Building Initiative to reduce energy consumption in the commercial building sector. Consistent with the President’s announcement on December 1, 2011, we encourage the Administration to issue guidance for partial deduction pathways for the building envelope as well as the heating, ventilation, and air conditioning (HVAC) system. In addition, we strongly support the effort to simplify the 179D tax deduction, especially for existing buildings, and look forward to working with you in this effort. We are happy these recommendations are being reviewed by policy makers throughout the federal government and hope that the Department of Treasury acts on this important recommendation since they have firsthand knowledge that green building sits at the nexus of saving people money, saving energy and creating jobs. For more information on 179D, read our post "Encouraging Energy Efficiency: A Tax Fix Everyone Can Get Behind"
As part of the USGBC community, you’ve been introduced to Project Haiti over the past year. You’ve heard us talk about rebuilding this orphanage and children’s center in Port-au-Prince that was destroyed in the earthquake that devastated the region just over two years ago. You know that Project Haiti is set to achieve LEED Platinum and the impact that will have – from creating jobs and teaching local Haitians how to “build back better” to providing a resilient model for rebuilding that all countries can learn from and replicate. As Roger Limoges, Project Haiti lead and vice president of organizational development at USGBC says, “If we can build LEED Platinum in Haiti, we can do it anywhere.” Project Haiti is a powerful symbol of what’s possible in the green building movement and its impact will be vast. But it’s of course more than that. What you haven’t heard us talk much about is Fondation Enfant Jesus (FEJ), the beneficiaries of Project Haiti. It wasn’t until last week, when I traveled to Haiti myself, met the amazing people from FEJ and spent time with the children and staff at their facilities, that I fully understood the impact this project will have on FEJ and the communities it unselfishly serves. Next week, the House is expected to debate H.R. 7 “American Energy and Infrastructure Jobs Act.” The bill is the long awaited legislative product to reauthorize a number of federal highway, transit, rail, planning, trail and other programs. Unfortunately, H.R. 7 doesn’t look to be long term solution to our nation’s surface transportation problems. H.R. 7 provides roughly $260 billion over five years for transportation needs including roads and bridges, bus and rail, and other programs. Regrettably, the proposal removes the small funds from transit in the motor fuel tax and redirects it into highway spending. This means that projects to support or expand bus, light rail and other transit efforts would no longer have a predictable funding source. Projects like these would be subject to yearly funding battles in the appropriations process that would pit programs against each other for funds. This is a sad development that would likely yield minimal investment in modes of transportation that help to ease congestion on our already crowded streets. USGBC joined more than 75 national organizations — including the Transportation for America, the American Public Transportation Association, American Society of Civil Engineers, and the National Association of Counties— and a list of other individuals and state & local groups urging the House Ways and Means Committee to reject policies that would undermine investment in transit programs, but unfortunately this effort largely fell on deaf ears. For more information on how to voice your concerns click here. This entry was cross-posted from MetropolisMag.com. USGBC's close collaborators in Project Haiti, global architectural firm HOK, have published a series of blog entries on their efforts to design the first LEED Platinum orphanage and children's center in Port-au-Prince, Haiti. Their pro-bono design efforts have been met with great enthusiasm, but also unique challenges. Read more about the design process for Project Haiti on HOKlife.com. Early in the Project Haiti process, our team decided to meet the design requirements of the ICC 2009 International Building Code—also encouraged by the Haitian government for new construction since the 2010 earthquake. We were already familiar with the code and so we believed it would provide the best opportunity to create excellent design. Selecting a code was also a means by which we could ensure the safety of occupants. HOK has never worked in Haiti before. Our partner, the U.S. Green Building Council, is focused on adapting to a new global perspective in sustainable design. These two factors made for a project with unique challenges. And, we knew at the outset that we’d have difficulty following codes written for consumer-based, resource-rich nations. Amidst the chaos in the earthquake’s aftermath, an underlying sense of self-enforced order supports the Haitian desire to own and operate at a Western standard. They, too, are looking to build fiscally sound, structurally stable, and economically progressive projects. The difficulty? Haiti has very little infrastructure to support these goals. As we work with the code here, three items continually demand our attention: constantly checking on the realistic cost of building to code, developing an educated workforce to achieve code-compliant design, and the acquisition of materials in a resource-poor country. The residential streets of Port-au-Prince. (image courtesy of HOK). It is easy to make assumptions about infrastructure in the U.S. An engineer working in St Louis, for instance, can have confidence that when she/he specifies a high-strength structural bolt, it will be available domestically, with little to no lead time, and at a reasonable price – all saving time and money while easily meeting the code. This is not the case in Haiti. 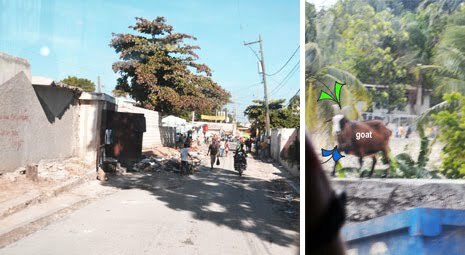 Port-au-Prince only recently acquired such basic things as garbage trucks – a welcome site for residents living on streets lined with goat-eaten trash and building debris. Read Rick's entry on Huff Post Green. By now, most of you know the cautionary tale of the old railroad barons, those filthy rich guys who, nearly a century ago, made the tragic mistake of thinking they were in the business of trains. Can you imagine how things might have gone differently for those complacent and ridiculously misguided yahoos had they realized they were actually in the people-moving business? That's why I continue to get frustrated when people try to put narrow, self-important labels on our green building movement. Unlike the train business of 100 years ago, our movement is not self-defining. It is not limited in scope. And it is not linear. In January, USGBC launched its second advocacy campaign of 2012, Mainstream Benchmarking. Through this campaign we will advocate for policies that will bring the benefits of energy benchmarking to all commercial buildings. So why benchmarking? Why now? The answer is simple. The green building movement has made many technologies and processes standard practice by building new LEED buildings and by retrofitting existing buildings; however, many spaces are not considered energy efficient. There are low and no cost opportunities to stop this energy waste still abound. Last week, the UN Secretary General’s High-Level Panel on Global Sustainability released a report of recommended outcomes for the Rio+20 conference in June. The report, Resilient People, Resilient Planet: A Future Worth Choosing, outlines both long- and short-term goals for governments, civil society and the private sector. These recommendations address all facets of resiliency, including climatic, economic and social. Below are a few of the UN Panel’s key recommendations that align with the goals of sustainable communities, many of which are already being addressed by the green building industry. As we already know, cities are a key to the success of the sustainable development agenda. Cities have the political will and flexibility to implement development goals more easily and quickly than national governments. Cities also have greater influence over the construction of buildings and infrastructure within their borders and can aid or incentivize the use of sustainable strategies. Past experience will also show that cities are leading the way by implementing innovative policies. See the World Green Building Council’s Government Leadership Awards publication for case studies of the leading green building policies in the world. Even though I live in D.C., I often wonder, “What is Congress even fighting over?” It seems like everyone else in the country is asking the same question. This is especially true when our elected officials endlessly debate “jobs.” Aren’t jobs universally supported? Why would anyone be against putting Americans back to work, especially in the industries we know we need to remain competitive? How can everything simultaneously “create millions of jobs” and still be a “job killer”? The Army is still going for Gold and Platinum despite recent legislation calling a halt to LEED spending. The federal government has been one of the biggest supporters of LEED certification in the last few years, with the General Services Administration (GSA) requiring basic LEED certification for all federal buildings starting in 2003 and then upping that requirement to LEED Gold in 2010. The military has been on the cutting edge of green building from the beginning. The Navy adopted sustainable design principles before LEED even existed, as we reported way back in 1998. 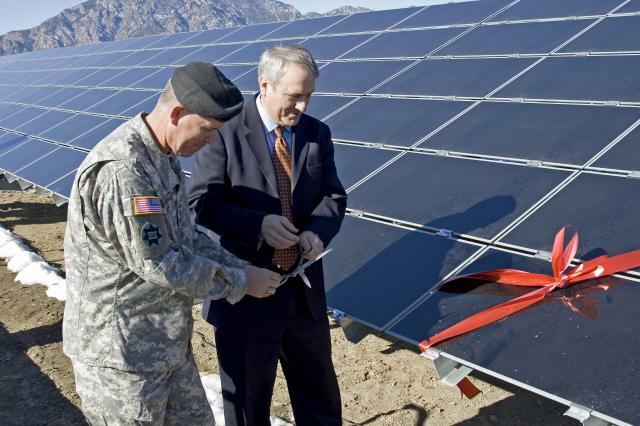 The Army embraced LEED in 2006 and recently began the much more radical work of moving all its installations to net-zero energy, water, and waste. 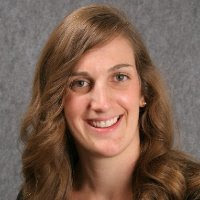 As Katherine Hammack, assistant secretary of the Army for installations, energy, and the environment, put it to EBN earlier this year, "Energy security is mission critical." and waste--and expects to meet that target by 2020. Hammack is having none of it. 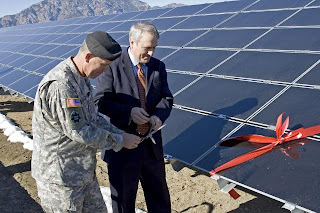 In a call with reporters yesterday, she reiterated the Army's commitment to net-zero and LEED and gave an update about some of the progress that's already been made. "We're finding it does not cost more to design and construct to LEED" standards, Hammack said. 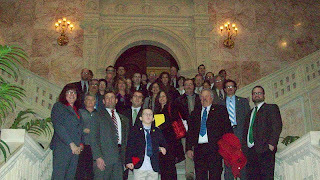 On Jan. 25, members of the three USGBC Chapters in PA (Delaware Valley Green Building Council, Green Building Alliance and USGBC Central PA) went to Harrisburg for Advocacy Day. While we were there, members spoke to their representatives about green building and green schools, with a focus on House Bill 193, an act requiring state-owned buildings to comply with energy and environmental standards. Five schools from around the Commonwealth displayed green schools information in the rotunda. The day was a smashing success. House Bill 193 was approved in the House the next day by a vote of 170-18, helping to cut energy and water use, reduce air and global warming pollution, make our public employees more productive and save taxpayers money too! Two legislators, on the fence before our meetings, voted in favor of the bill. After the day, we got great reviews from Pennsylvania Representatives. Representative Todd Stephens wrote: "thanks for taking the time to meet with me to educate me on your initiative. Congrats on passage of the bill too!" And Representative Justin Simmons wrote: "HB 193 passed the House today. I voted in favor. Thank you for meeting with me yesterday."